That’s why the dining room is one of my favorite rooms to design and transform for my clients. I am so lucky to work with amazing clients that trust me with their homes. We work together to design beautiful rooms that feel like home and have a unique touch. Today, I’m going to tell you how we make dining rooms look amazing. When it comes to dining rooms, I always say, don’t be scared to be bold! Think about restaurants and how the design usually encompasses bold statements, whether it’s the chairs or chandeliers — this makes the space feel special. When designing a dining room, I have to remind my clients to not forget to decorate from the waist up. Other than the classic table and chairs, there are so many important components to a room such as drapes, rugs, plants and art that really bring the room together and make it something special. Let’s start with the art. The dining room is a perfect place to incorporate a conversation piece that will bring the room and the people in it together. Talking about where the art came from, when it was received, and the artist behind it leads to many meaningful conversations. There are so many options, such as work from local artists or something sentimental, like when we framed all of the menus at restaurants this client went to on their anniversary each year, and placed them on the wall. When thinking about art, it is critical to ensure the size and amount of pieces of art is correct. I strongly suggest against placing one small piece of art on a large wall. Rather, I suggest creating a gallery of art on the wall with multiple pieces, or a piece of art large enough for the room. If art is not an option, using multiple mirrors like we did at Tulane St. is a great substitute. This opens up the room and gives it the final touch it needs. Chairs. In my opinion, chairs are a totally overlooked opportunity to make a room unique. If you choose to keep the rug more neutral, the chairs can be where you make a bold statement. Something often overlooked when choosing chairs is the back of the chairs. When a dining room stands alone, the first thing anyone sees is the back of the chairs, which is why it’s so important to take into consideration their aesthetic! I love these chairs I recently designed for my Greyton Lane project. These chairs make the room pop and are specifically designed to look pleasing all around. Another tip I have for chairs in the dining room is making the host and hostess chairs a bit different than the rest of the table. In the Greyton Lane home, we used a different style chair. In other cases, you can consider a different fabric or look and feel. 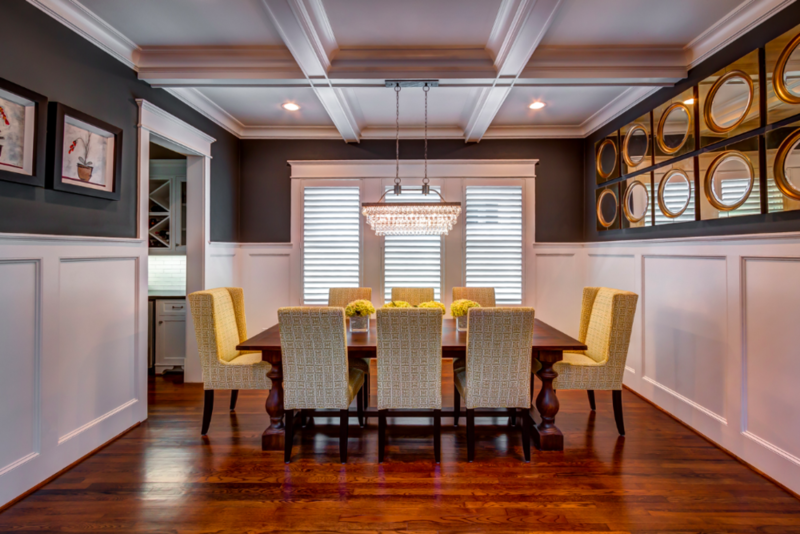 When enjoying a well put together dining room, the lighting is also critical. A nice chandelier (or two!) is a great way to brighten up a space and make a bold statement. 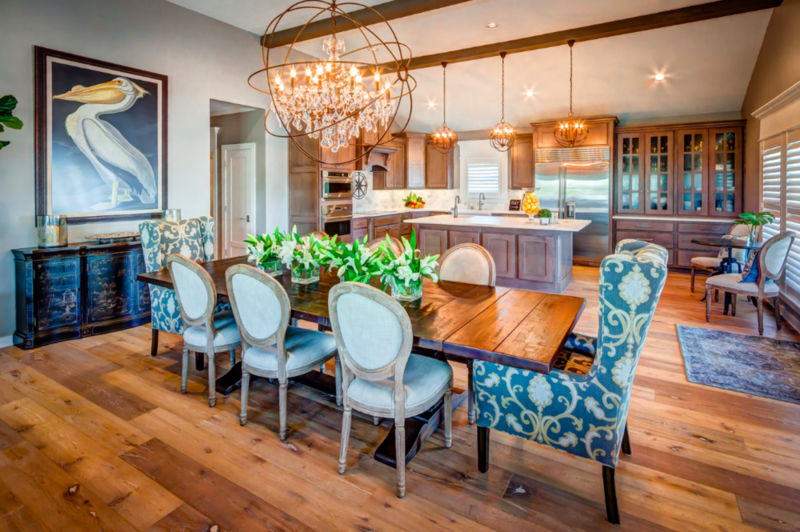 Using two chandeliers over a long oval or rectangular table and not being afraid to go too big with the chandelier are my general tips for success. The final touches of a dining room are the drapes and the table flowers. Drapes are also an important component to a dining room, and for that matter, any room! I always say that drapes can make or break a room and that they really set the tone. Don’t be afraid to go bold with these in the dining room. To tie it altogether, don’t forget the florals for the table. I like to use permanent flowers on a daily basis, and fresh florals and flowers when entertaining. This keeps the room looking fresh and lived in at all times. Pro tip: my favorite flowers to use when entertaining are multiple low line arrangements. That way, you can keep them on the table and still see over them and enjoy each other’s company. 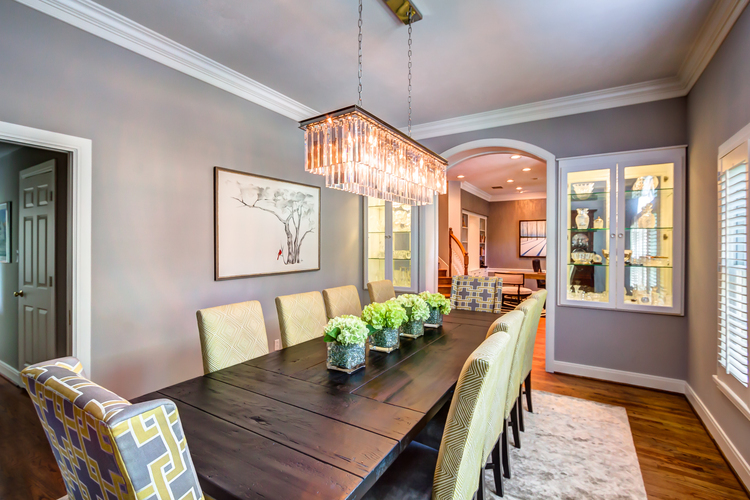 Transforming your dining room is a fun experience for everyone involved. Not only does it make it more fun to look at, but it makes the room more welcoming to your guests and family in order to create memories that last a lifetime! 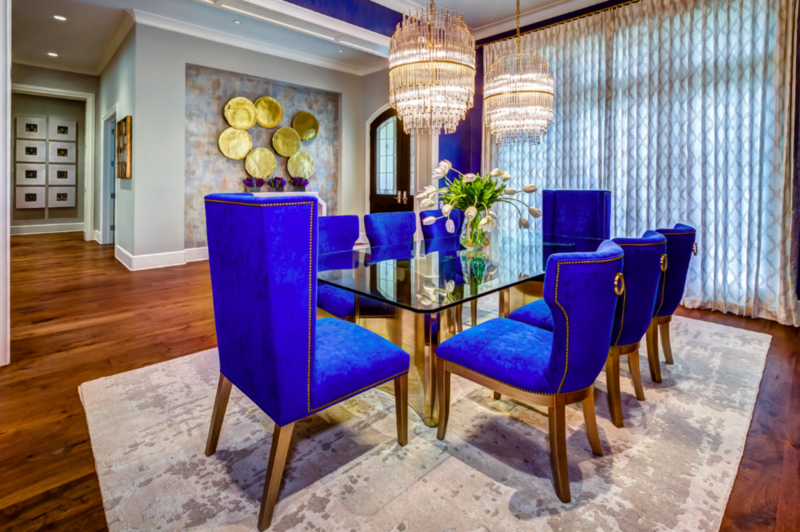 I’m lucky to work with my clients to create spaces that lift their spirits and I hope these tips helped you on your journey to creating a new dining room! If you’re looking to design your dining room, we’d love to talk! Don’t forget to follow me on Instagram for before and afters of some of my dining rooms and more!